The gameplay in this true WW1 battlefield experience is as immersive and gritty as it can get, with features such as optional realistic gore which portrays the true horror of the First World War and authentic weaponry including artillery and gas. Verdun's weapons need to be handled with skill - each gun handles differently and there are no floating crosshairs to aid your aim, along with realistic bullet physics that require you to lead your shots when firing on a moving target at long range. Choose a squad and prepare to assault and defend positions in the dynamic frontlines game mode that changes as each side gains or loses ground. Keep your head down or quickly don your mask in the event of artillery strikes or gas attacks. This unforgiving war isn’t for the faint hearted! 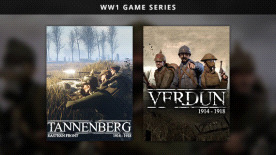 The 1914-1918 WW1 Game Series currently includes Verdun and Tannenberg (set on the Eastern Front). These realistic WW1 shooters let players choose from a range of squads from across the war, as they fight for control of the ever-changing frontlines.